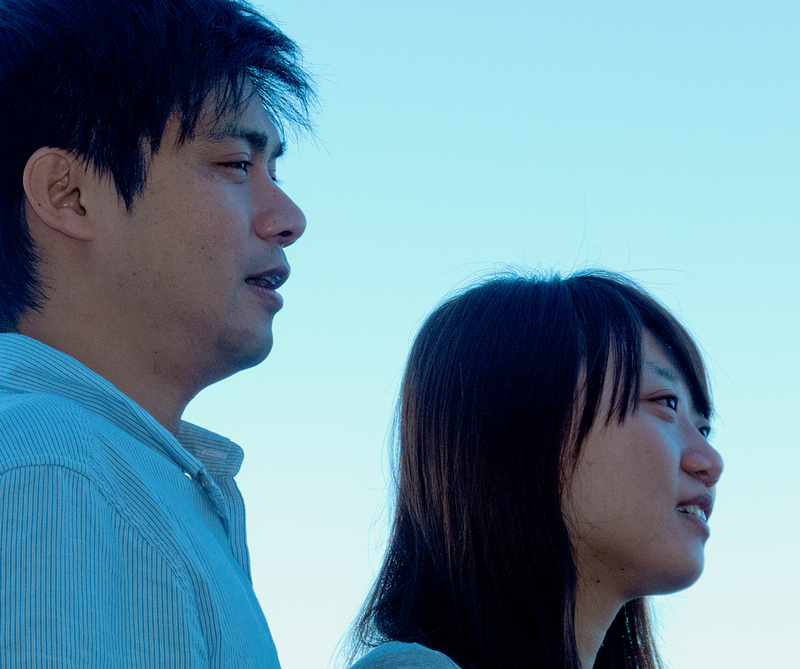 We met Kenny and Anna from Taiwan on our Galapagos cruise. They were our meal companions on the ship, and we were also in the same excursion group. They were great company and we’re hoping to visit them in Taiwan early next year. Kenny is an excellent photographer, and Anna is no slouch either. They graciously allowed us to share some of their photographs. Obviously the photographs that include Kenny were taken by Anna. The rest I believe are Kenny’s. This was our home for eight days. I love the trick perspective in this photograph, making the ship look far closer to shore than it actually is. 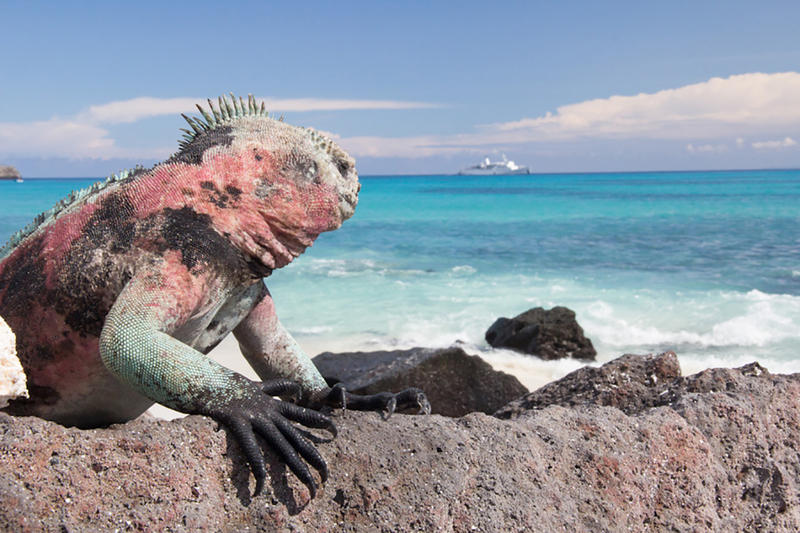 and a marine iguana. Does he see the ship? Does he care? I doubt it. All the animals seemed so disinterested in our presence. 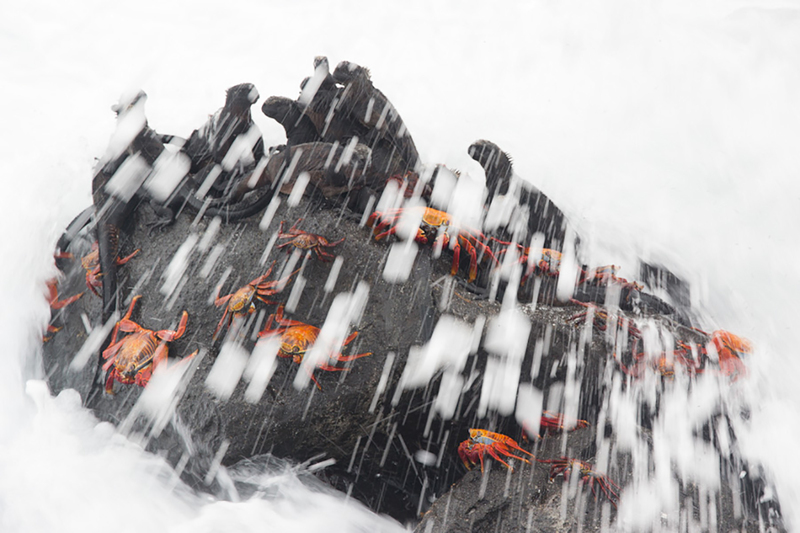 In an earlier post on the Galapagos I wrote about a big wave crashing over the marine iguanas and Sally Lightfoot crabs that sent them all swooshing off the rocks and into the sea. Kenny got a couple of shots of it. This is the one night we really wish we’d stayed longer on deck. 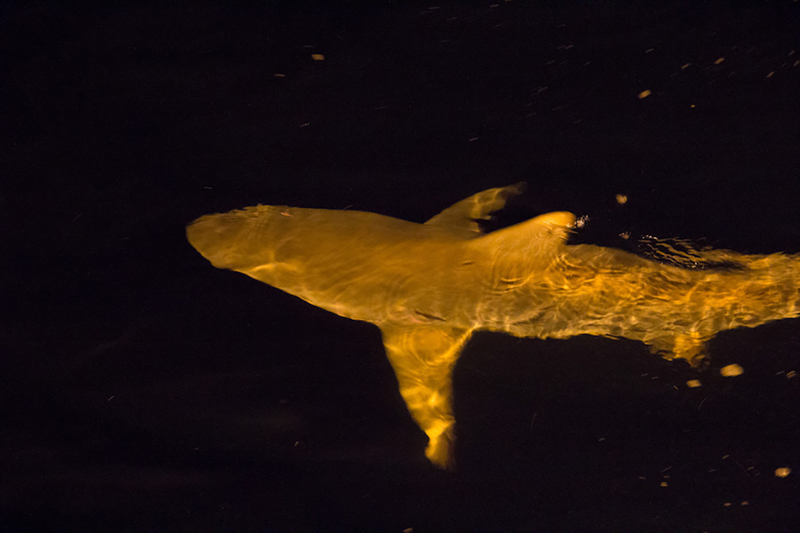 A group of sharks came to visit. Our guide Emil chilling on the beach. The sea lion is not in the least disturbed by Emil. Nor is this one even remotely upset about Kenny’s presence. 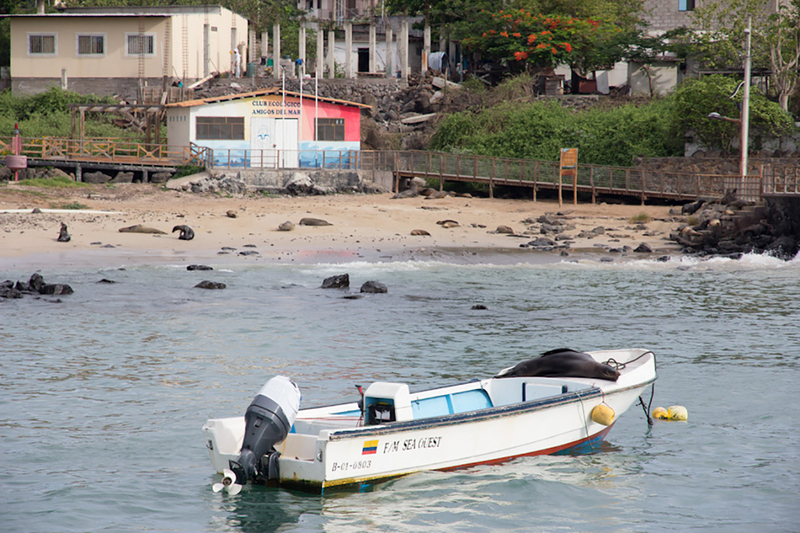 The next three shots were taken in the town of Puerto Baquerizo Moreno on San Cristobal Island. and distinctive surprising rock formations. 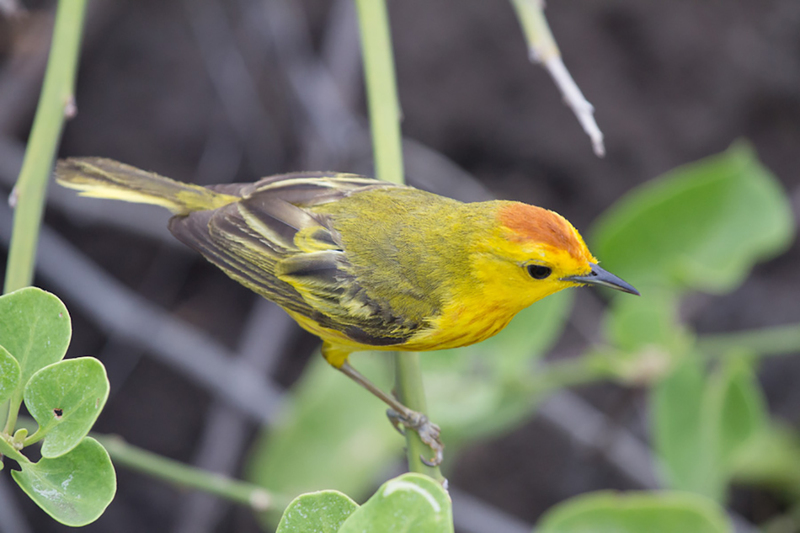 and others green and lush where Yellow Warblers hang out. 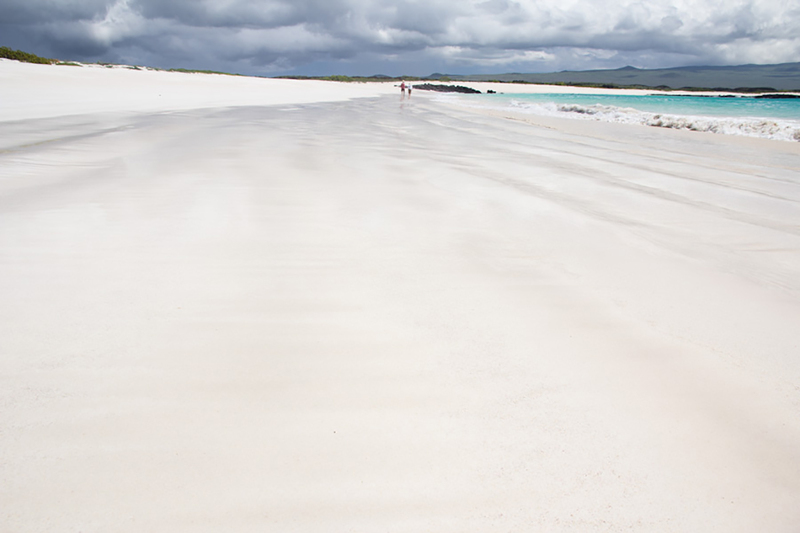 Galapagos is an extraordinary place, magical, unexpected. 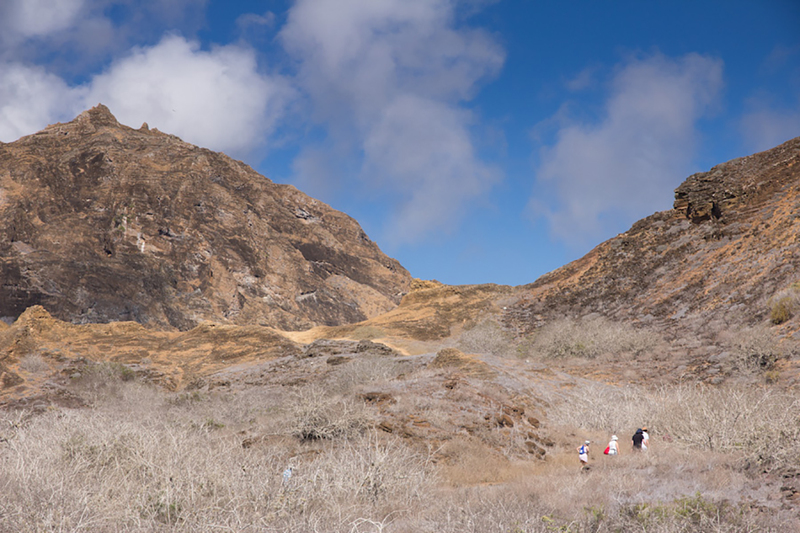 Out there in the middle of the Pacific Ocean close by the equator it is a tiny group of about 20 volcanic islands and a hundred or so rocks jutting out of the sea. A place where unique land and marine life flourishes. It is so remote it’s almost a mystery. And yet there it sits, a testament to the extreme abundance and diversity of life on this vast and varied planet. It’s one of the good things. I hope it stays that way. Thank you Kenny and Anna for your wonderful photographs. 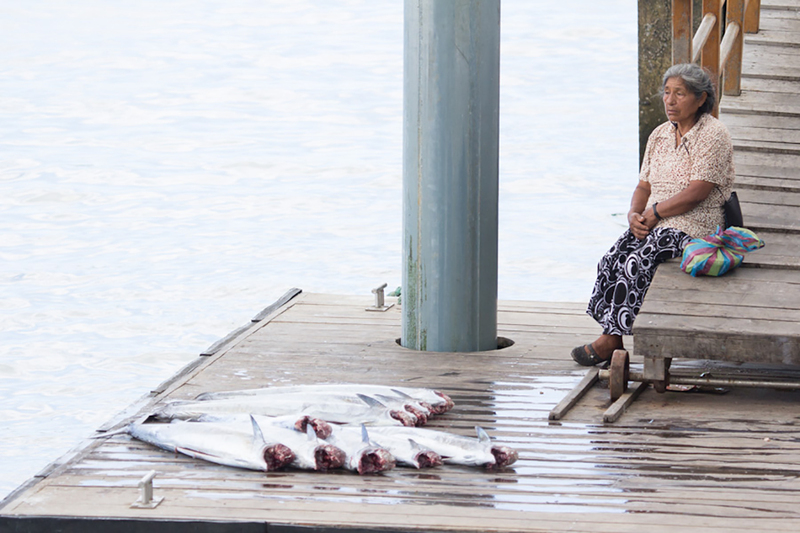 Next post: a portrait of South America. This was a wonderful weekend treat, Alison. 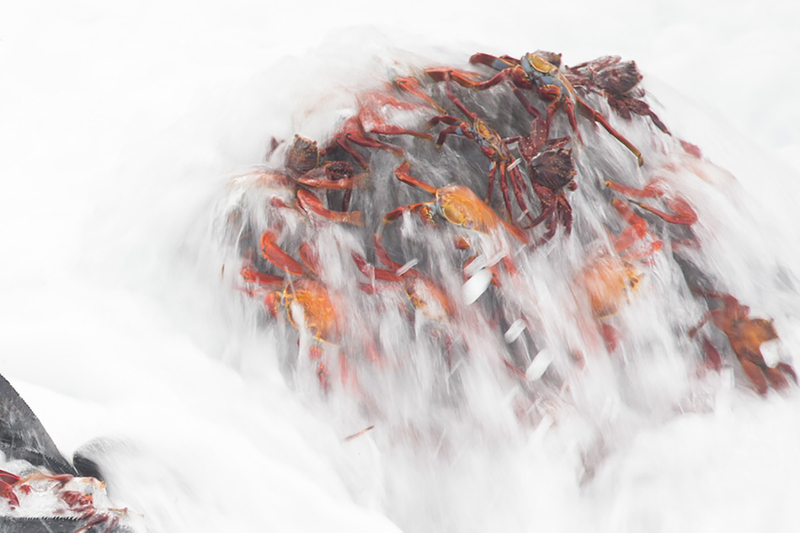 If I had to pick a favourite it would be the second one of the big wave – you can really get a sense of the crabs clinging on for dear life! Kenny takes fabulous shots, and as ever I loved your running commentary alongside. I was thinking of publishing my next post (on Komodo National Park) without captions but after reading this, I really shouldn’t shirk! Waking up on another Saturday morning here in England only to be transported to Wonderland by a collection of exquisite photographs. Many thanks, Alison, Don, Kenny and Anna! Thank you Hariod. I’m so happy to share Wonderland with Kenny and Anna’s beautiful photos. 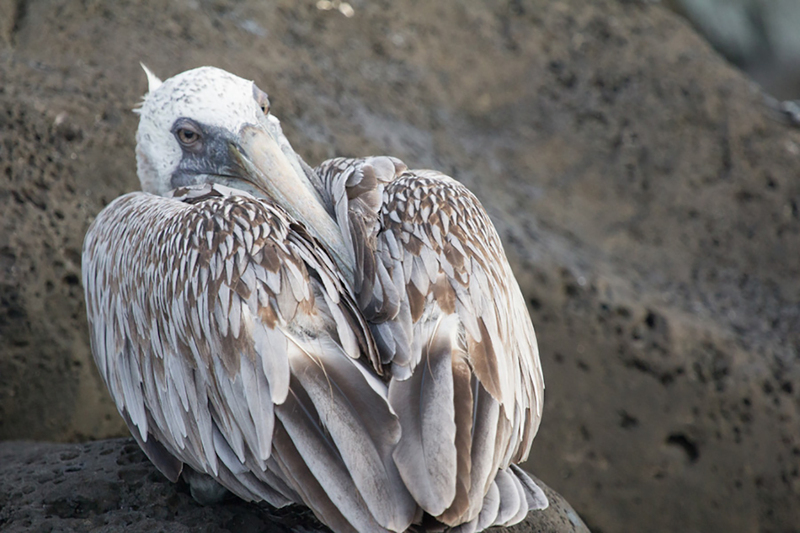 Such a refreshing perspective on Galapagos and its wildlife, Alison! I love Kenny’s shots as well. Not only did he take beautiful photos, but he also added a great dose of witticism in the photos. Aren’t they great. 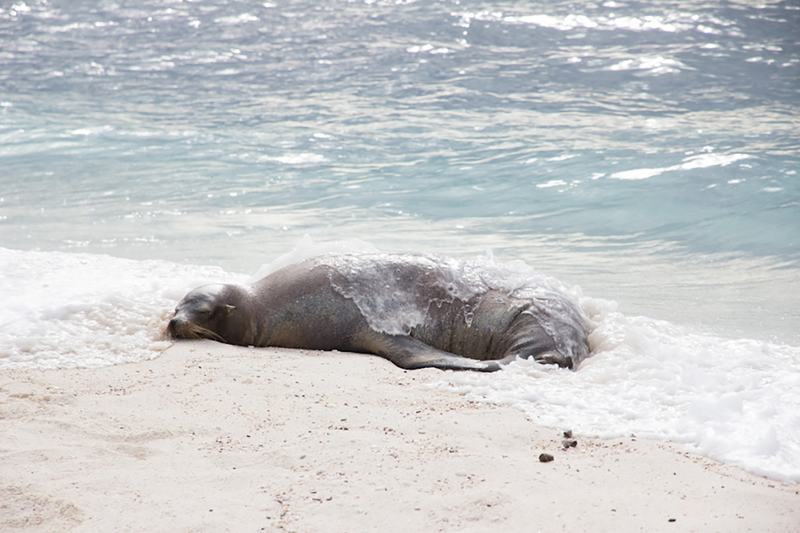 I love the one of him lying down on the sand next to the sea lion. And the one catching the wave rising up before it crashed on the rocks making the sip look so close, and the wave crashing over the crabs, and the one of the harsh brown landscape with those 3 tiny people walking through it, and, and . . . . .
Glad you enjoyed them Bama. 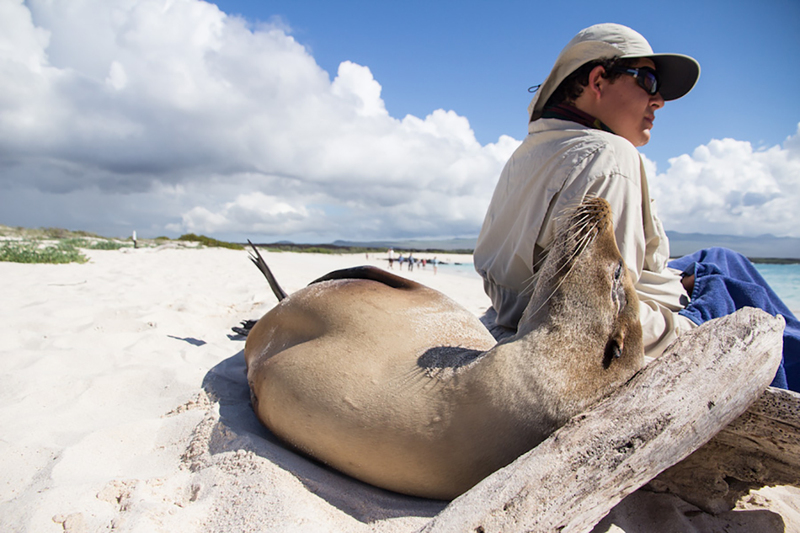 Galapagos is very special. Love the pictures! 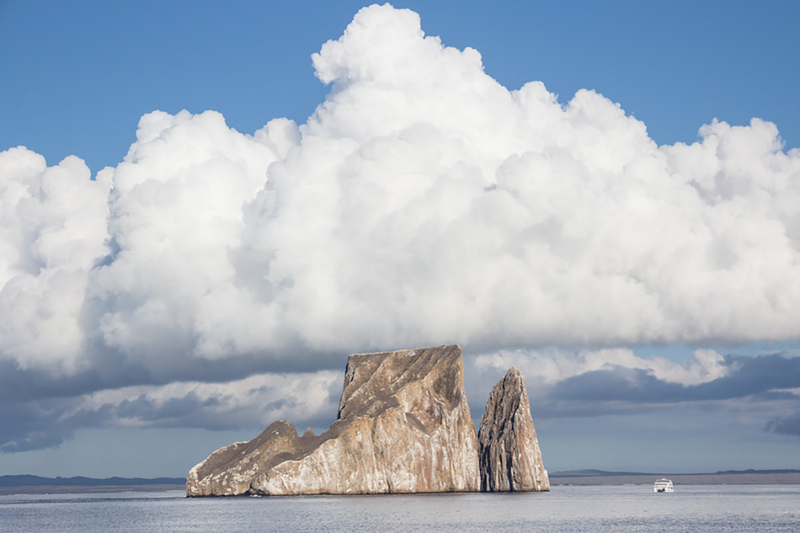 For some reason, I am particularly struck by the one with the rock formation and the clouds sitting on top. Love the gorgeous white sand too! Aren’t they fabulous photos. I just had to share them. I love that photo too of the rock formation – he really captured the feel of the place. And the white sand beaches are just beautiful. Isn’t that a beauty! And typical Kenny. Great pictures (as usual)! We loved all your writings about South America and this has inspired us to visit there! We leave on November 03 for five months, starting in Bogota and ending in Buenos Aires. We would love to meet you before we go – we will be in Kelowna from October 20th to the 26th. Is there any possibility of meeting up somewhere???? p.s. Yes, we are STILL in the process of divesting ourselves of all of our possessions and although we have already made a big dent in getting rid of things, it has been a painfully slow process. Both of us are still working full time so we only have had small blocks of spare time here and there. It now looks like next spring before everything is dealt with. We wish it was otherwise. Thanks, so glad you’re inspired to go to SA. It’s really an amazing place. You must make sure you go to the gold museum in Bogota. Unfortunately we won’t be in Kelowna for those dates. It’s just not meant to be – I’m in Kelowna Oct 30 to Nov 3! Any chance you’ll come to Vancouver? Except for my visit to Kelowna we’ll be in Van until end Nov.
One day all the divesting will be done. It will go much quicker when you can do it full time. Also we did most of it, but later had to spend 3 months back in Van to tie up more loose ends. After 3 years it’s more or less done now though Don still gets the odd letter from his business. Ever since I started to follow you and Don on your wonderful adventures I have felt so much respect for you for all the time and for all the thought you put into responding to each one of us individually on this blog. Thank you for this! Anyway, we will make every effort to meet you in Vancouver sometime during the last two weeks of October, if such a visit will work for you. I will be in touch closer to the date. We certainly plan on being in Van during that time. Hope to see you then. Do get in touch with us. Thank you. I agree – their photos are beautiful. Aren’t they great?! Just had to share them. I agree – extraordinary photos. They’re very talented. These images are amazing, Alison! What a treat to see them and to read your thoughtful words. Thank you Dani. So glad you enjoyed their photos. I feel I learned some different ways of using a camera just looking at them. Hi, Don and Alison.I am just a photo addict, when I took the photo, actually I did not think that much.. it is indeed interesting to read the decription of my photos from you. I am glad that you will be in Taiwan soon. I am really looking forward to your coming. I learned some new angles to try from you and got some good shots of the beach here in Vancouver during the past weeks. Thanks for letting us use your photos. Hope we make it to Taiwan! Just home from 9,000+ feet in the Colorado Rockies (for a Labour Day visit to our mountain property), checked in on Adventures in Wonderland — and what do I see but more spectacular photos of one of my new favorite places in the world! H-m-m-m-m, something about that stretch of intense white sandy beach really drew me in. Yes! Wow! You must have had a fabulous weekend. And 9000′ is not nothing! Did it get to you or are you used to it? Aren’t Kenny and Anna’s photos great?! That stretch of white sand really is as beautiful as it seems. I do love the pep talk! If the Andeans can do it, so can I! WTG! Maybe if I was sporting an excellent hat in the high country it would make me feel more Andean?! 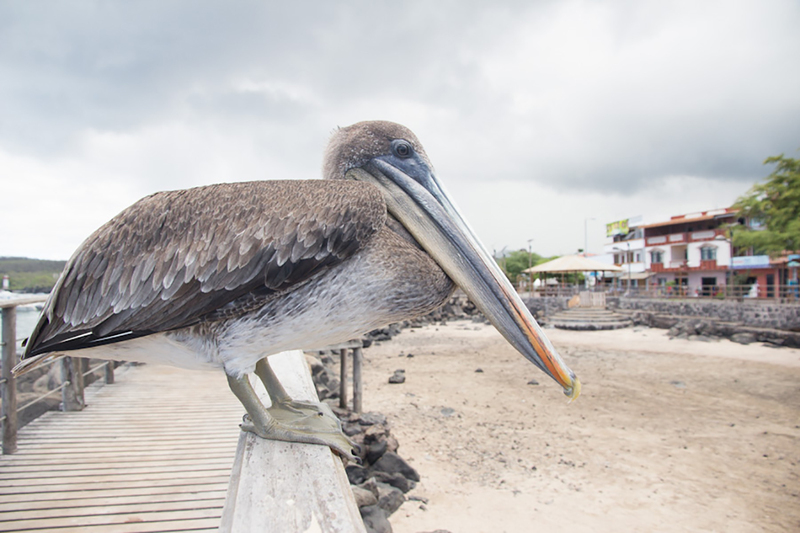 Thanks for yet another glimpse into Galapagos life. Looking forward to South America next – that is right on top of my travel bucket list and I can’t wait to get there sometime soon! Thanks YoS. 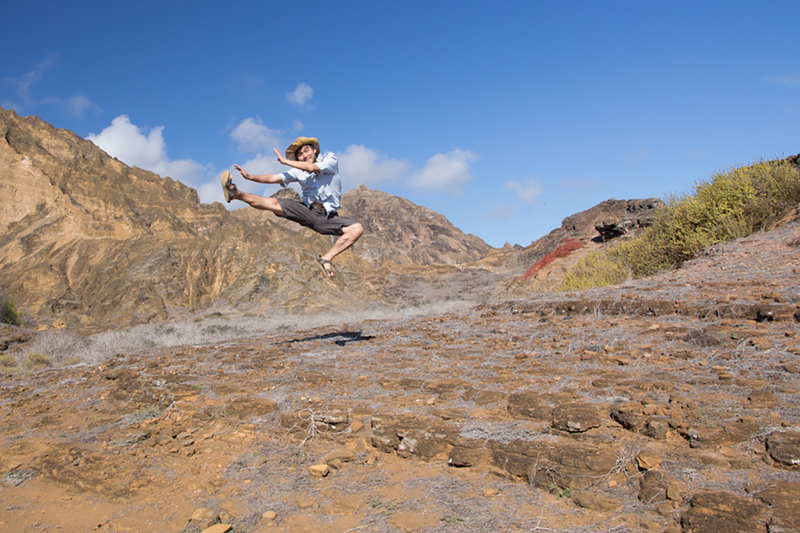 On Galapagos the wildlife has never had reason to fear humans (except the tortoises) so they’re completely oblivious. It’s a very special place, and I was glad to be able to share Kenny and Anna’s photos. I also love the dancing gull and the dancing Kenny – I think they are two of my favourites. South America is extraordinary and definitely worth a visit. Wow, this looks absolutely amazing, those photographs are great. 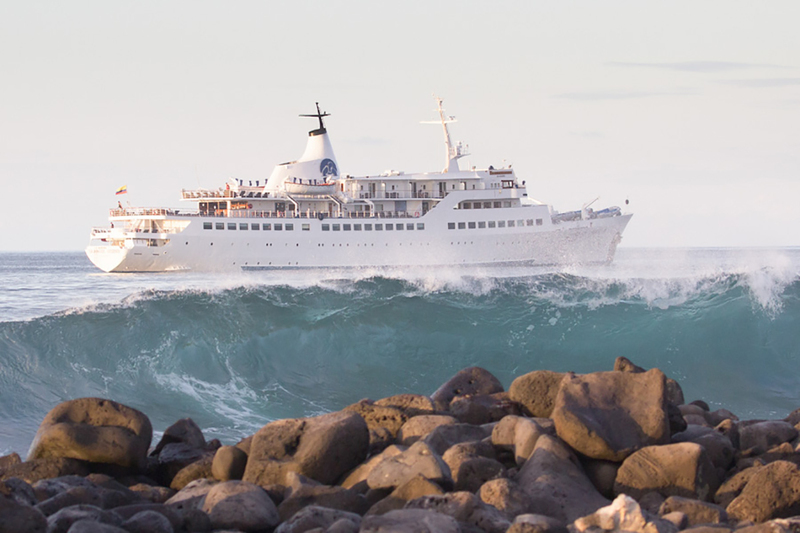 The Galapagos are somewhere I have always though about going… this just might give me the push!! I really recommend going. It’s truly unlike anywhere else. 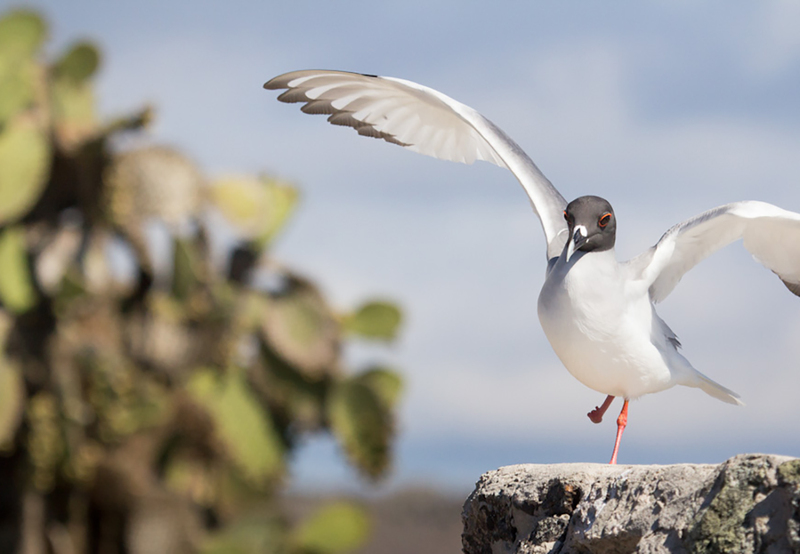 Amazing, those photos are really great, looks like we should pay a visit to the Galapagos! Aren’t they fabulous photos – I just had to share. Glad you enjoyed them. Galapagos is definitely worth a visit. The image of the iguana on the rock with the ship in the background strikes me as a real Jurassic Park kind of moment. Like that lizard has been there for a few million years, and will probably be on that same rock for a few million more, while those flash-in-the-pan, ship-building, photo-making, seal-carousing, crazy beings that move around in steel canisters will probably have come and gone. You just get the sense the lizard knows something we don’t. A delightful post once again! I think the photo of the iguana looking out to sea with the ship in the background speaks to Kenny’s vision – the kinds of things he sees to photograph. It’s such an interesting juxtaposition that makes it one of my favourites. We never encountered aggressive sea lions except when one was disturbed. It was asleep in the shade under a bush and one of the people in our group unknowingly used that bush to drape their towel, and daypack. 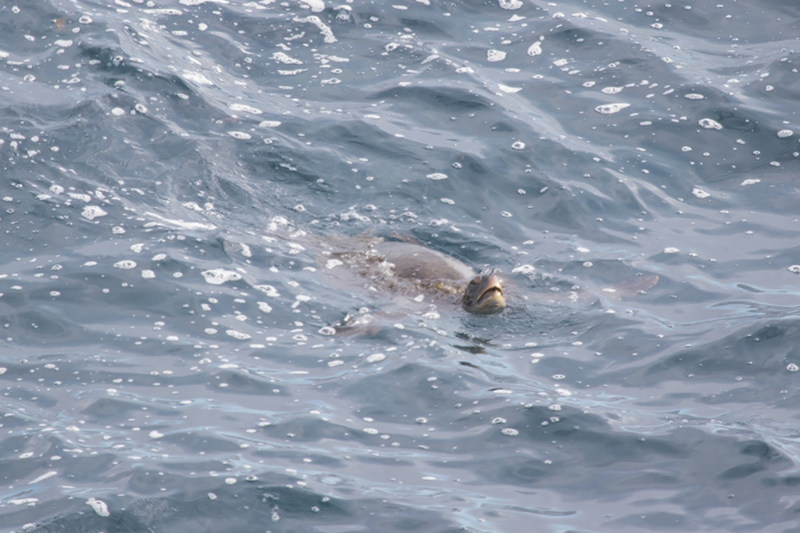 The sea lion came rushing out, but it wasn’t really aggressive, rather a bit frightened. There is a ‘no closer than 2 metres’ rule but it was not strongly policed as long as people were quiet and respectful, which everyone in our group was. 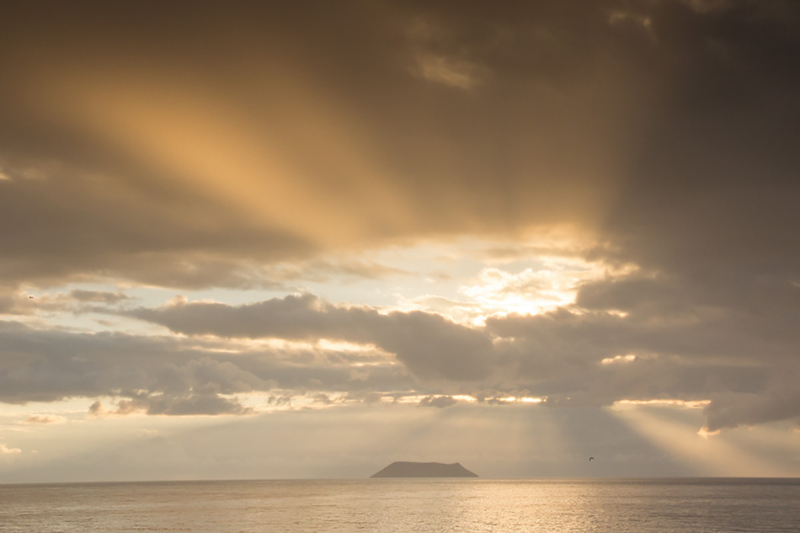 The Galapagos is definitely worth visiting! We always planned to go to the Galapagos, but it has been no more than a distant ‘maybe some day’. Your post made us put it on our bucket list. Thanks for those precious memories of your time there. It really is an extraordinary place. Good you’ve put it on your bucket list, I’m sure you won’t regret it. Stunning photos! How fortunate you were to meet such compatible travel companions! 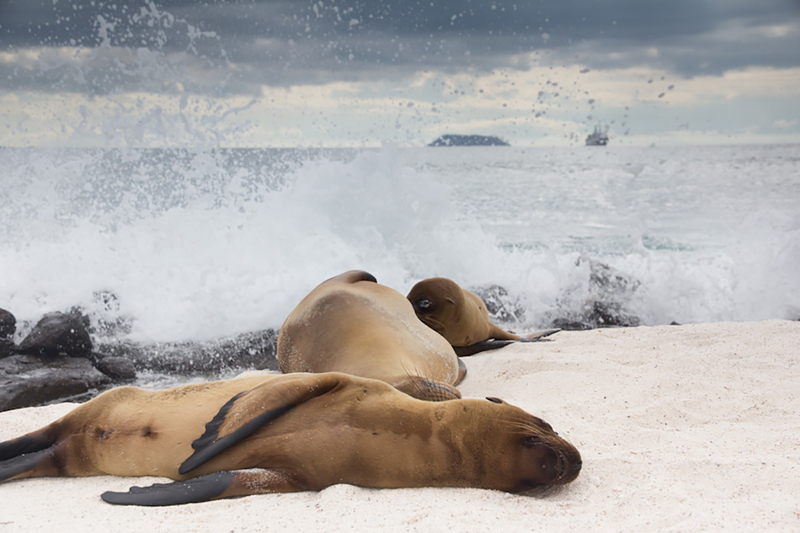 Galapagos is definitely on our to-go list! Aren’t their photos fabulous?! Yes, we were lucky. We also had some other wonderful dinner companions, 2 American couples, so our table for meals was pretty happy. Those are two of my faves too. The one with the crabs really struck me. I think there’re both pretty amazing photographers. Love the picture of Kenny and the Sea Lion. Those ones of the crabs are really cool too. Hi Hannah, welcome. I had a quick look at your fabulous blog! I’ll go back and check out more. 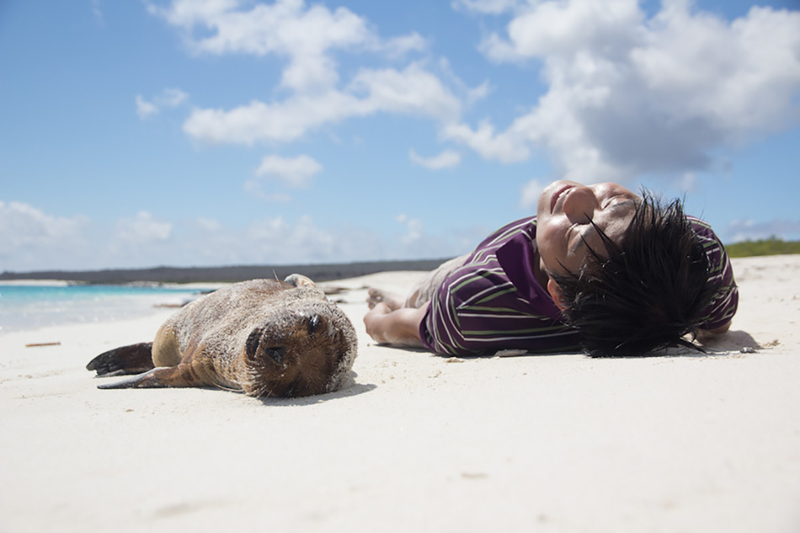 I do agree that the one of the crabs and Kenny lying on the sand with the seal are very cool photos.